The Boone Central/Newman Grove Lady Cardinals notched their second win of the 2017-18 season in the first round of the Holiday Hoops at Boone Central tournament Friday, then came within three points of claiming the tourney title in Saturday’s championship game. Boone Central/Newman Grove (2-6) opened the holiday event with a hard-fought 46-36 victory over top seed Adams Central (3-6). Carsen Grape scored three early buckets inside and Kelsey Thompson hit a 3-point field goal to give BC/NG an 11-2 lead. The hosts led 15-6 after one quarter and extended that with a Thompson jumper to open the second period. From there, Adams Central regrouped and outscored BC/NG 20-7 to edge ahead 26-24 at halftime. The Boone Central/Newman Grove defense clamped down following intermission, allowing the Patriots just three third-quarter points. The Cardinals carried a 32-29 lead into the final stanza and had just a 35-33 edge after a Lauren Hedlund free throw with 4:08 to play. Hedlund added two more free throws after a steal, and Kelsey Thompson followed with a jumper in the lane, then a steal and driving layup to give BC/NG a 41-33 lead with 2:28 remaining. Boone Central/Newman Grove had another strong start in Saturday’s championship contest, but could not hold off the Bennington Badgers (3-5) in the final period of a 47-44 loss. 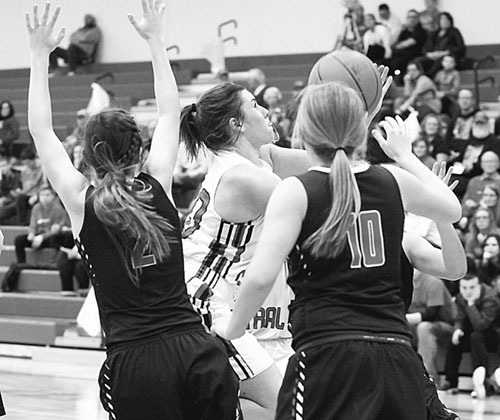 Five Badger points to open the fourth gave Bennington its first lead before Thompson cashed a 3-pointer and added a jumper in the lane to tie at 39-39. After taking a 43-39 lead, Bennington missed the front ends of three 1-and-1 opportunities, allowing BC/NG a chance to rally in the final minutes. Rupprecht made one foul shot with :15 seconds remaining and Hedlund followed with a 3-pointer from the left wing to pull the Cardinals within a point with :08 on the clock. Rupprecht sank a pair of free throws after being fouled immediately by BC/NG for a 46-43 Bennington lead. Hedlund was also fouled, sinking one of the charity tosses, and the Badgers added a free throw with 3.8 seconds to play. BC/NG inbounded to Hedlund and her half-court heave at the buzzer bounced off the rim.